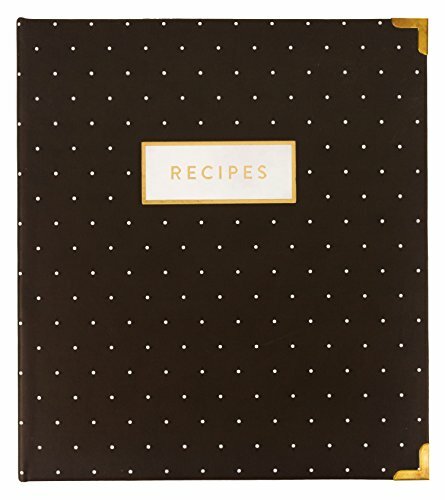 Eccolo's 3-ring binder recipe book is a scrapbook inspired place to organize recipes in an attractive and convenient way. Choose from an assortment of covers, one is sure to be perfect for you or for that special gift. Covered in stain resistant faux leather that lets you wipe away small spills, these binders are filled with everything you need to start recording your favorite recipes. They feature multiple sections with pages where you can write down recipes, plus pockets and an Accordion folder let you stash those previously written. Includes a package of 4 x 6 recipe cards that even have their own pocket for shorter recipes. Eccolo is a family owned and operated import and manufacturing business. We maintain full time offices in new York City and Florence, Italy, and ship from our new York location. If you have any questions about this product by Eccolo World Traveler, contact us by completing and submitting the form below. If you are looking for a specif part number, please include it with your message.